Tiny Houses Find a Friend on the Gulf Coast Bigger is not better for a growing number of homeowners who live in, or use, tiny homes. The storm-ravaged Gulf Coast — where much of the housing is gone — is one place where miniature homes are trying to take root. 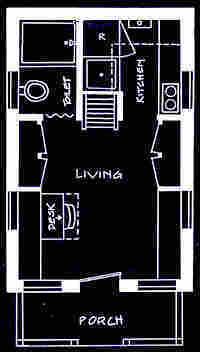 The layout for the Tumbleweed Tiny House Company's 100-square-foot Vesica model is typical of a small house. It includes a built-in ladder that stands at the house's center to provide access to the sleeping loft. Bigger is not better for a growing number of homeowners who live in, or use, tiny houses. The storm-ravaged Gulf Coast — where much of the housing is gone — is one place where miniature homes are trying to take root. The cradle of very, very small houses, however, is in the Midwest. Greg Johnson is a technology consultant in Iowa City, Iowa. He is also president of the Small House Society. Stretching his arms wide, Johnson can almost touch both sides of his home. On one side there's a sink with two containers of water. And on the other side is a desk area. There are also small closets and cabinets where Johnson stores clothing, tools and a foldable ladder for getting upstairs. The cathedral ceiling in his house is high enough to allow for a sleeping loft. It is an efficient use of every inch of space. For Johnson, it is a way of life. Artist and architect Jay Shaefer, who lives in his own 70-square-foot home near San Francisco, designed and built Johnson's house when he lived in Iowa City. 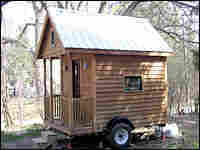 Shaefer is the owner of the Tumbleweed Tiny House Company. He sells plans for, and builds, tiny homes in sizes ranging from an extremely small 50 square feet to a practically roomy 500 square feet. Buyers use them as homes, home extensions, business offices and vacation cabins. Next door to Johnson's small, sturdy domicile is his father's much-larger structure. Johnson showers and uses the bathroom there, or at work, to allow for more storage space in his house on wheels. At the back of his home, there are several propane tanks used to heat the place. The roof is a solid sheet of metal and the siding is cedar. Both are sturdy materials that require little maintenance. With its small front porch, Johnson's house is a traditional home in miniature except for its wheels and its trailer base. Instead of paying real-estate taxes, Johnson simply pays the fees for his license plate. The cost of the house was $15,000 three years ago. Along the Gulf Coast, where fierce winds and massive storm surges from Hurricane Katrina flattened thousands of homes, the idea of small homes is attractive. 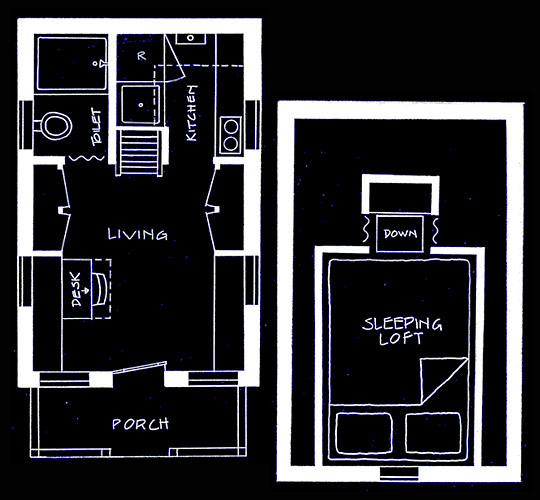 Mississippi has developed a prototype for housing hurricane victims called the Katrina Cottage. But Julie Martin, who lived on a government-supplied ship in Pascagoula for four months, isn't waiting for the state. After finding out about the Tumbleweed company, she called Shaefer and worked with him to develop what Martin calls a Gulf Coast model. Martin used to restore historic houses. Her former home, a three-story Spanish customs house built in 1787 in Bay St. Louis, was reduced to a pile of rubble when Hurricane Katrina trashed the Mississippi beachfront. Martin's tiny house arrived in February. The stairs to the front porch lead into a house with plenty of windows, nine in all. Almost luxurious in size compared to the homes of Shafer and Johnson, it measures 8-by-20 — still tiny enough to be considered a trailer. There's a small countertop stove, a dorm-size refrigerator, a composting toilet and even a walk-in closet. Martin powers her home simply by plugging into an electric outlet. She gets water by hooking a garden hose to a faucet. Martin calls her house the anti-FEMA trailer. She has been able to live in the yard of a friend's home, and on some wooded property her father owns. Her tiny home has also put Martin back in business. After working out a licensing agreement with Jay Shaefer, she's selling three versions of the Gulf Coast model home to others waiting to rebuild. She's calling her new company House-to-Go. Martin is counting on the niche product becoming a practical solution to the Gulf Coast's housing shortage.